It’s not long to go now until we have to bid Rick Grimes farewell, and judging by The Walking Dead season 9 episode titles just released, it could be slightly sooner than we first imagined. The first half of the season – all eight episodes – now have a title (except one, but let’s get to that in a moment), a writer, and a director, and it all quite plainly charts the course for the season ahead. Episodes 5 and 6 definitely have the most ominous names there. What Comes After reads like an especially dramatic episode (especially when you have ones like The Bridge in there… seriously? 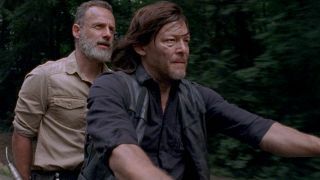 ), and it’s even directed by Greg Nicotero, the series mainstay who has helmed the likes of Negan’s first appearance and the reveal of who was on the barbed end of Lucille. Basically, something big tends to go down when he’s around. Then there’s the fact that episode 6 is Untitled. Unless The Walking Dead is going meta with its episode titles, that’s probably a placeholder before the reveal of something much bigger and bloodier. It appears that those two episodes are the key candidates for when we’ll be saying goodbye to Rick. It’d probably be best to mark November 4 and November 11 in your calendars now – and book time off work if you have to. That’s going to be a rough week.